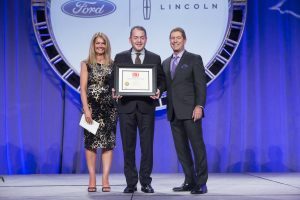 Longmont, CO – – – Eight Black Executive Transport, located in Longmont, Colorado, was named last night as the winner of the Operator of the Year Award at the International LCT Show in Las Vegas. Eight Black Executive Transport is a small, independent ground transportation company owned by Simon Chen and Matthew Deutsch. Chen has lived in Colorado for four years. Prior to moving to the US, Simon and his family were based in Singapore. He has spent the past 15-years consulting with technology companies across Asia Pacific and the US and has held several senior management positions for large multinationals. “Because I’ve utilized so many different types of transportation services, I understand the demands placed upon busy travel executives. That is something that sets us apart – our concierge level approach to customer service,” Chen notes. In addition to his experience as a user of executive transport, Chen has a passion for driving and taught part-time for over a decade for the largest Advanced Driver Training company in Australia. Deutsch is a Colorado native. He has years of knowledge and experience in the limousine and taxi industry. He’s completed over 5,000 trips and driven nearly 300,000 miles to and from Denver International Airport, Colorado ski resorts, and other major events. In September 2016, Eight Black acquired a small mountain operator, Alpenglow Express. In January 2017, the Longmont Shuttle was announced. The launch of Longmont Shuttle was a direct result of Super Shuttle abandoning some Colorado markets including the Fort Collins, Loveland, Greeley and Longmont markets. In a short space of time, the local Longmont market has responded in overwhelming fashion regarding the quality and efficiency of the shuttle service. “Our experience with the Longmont Shuttle has been very positive. The community has embraced us, we are serving more and more people every day, and we are assisting people by providing mobility options. That is often challenging for people,” said Chen. The LCT Operator of the Year Award is the limousine industry’s leading award for business achievement. Each year LCT chooses six operators who excel in the areas of Customer Service, Technology, Training, Media and Marketing, Safety, and Community/Industry involvement. One operator is recognized in each size group. Eight Black was recognized for their efforts in the 1- 10 fleet vehicle category. Celebrating its 33rd year in 2017, the International LCT Show is the biggest convention for limousine, charter and tour operators in the world. It is recognized as the ultimate destination for operators around the globe seeking education, product showcases and peer-to-peer networking. For more information, visit www.eightblackcars.com.